Different reasons might lead you to decide to get custom garage doors. One of the most common reasons for such decisions is sizes. When the standard residential and commercial garage door sizes do not meet your home or business needs, you need to order a door that will fit perfectly. 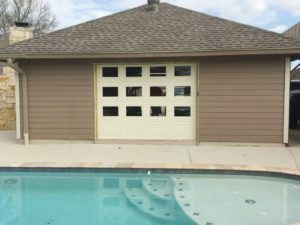 Now if you add to that the need to have a unique door in terms of style, color, and design, you have a few more good reasons why you should have your garage door customized. Garage Door Service and Repair Inc is here to assist you. By ordering custom size garage doors, you have the freedom to install doors that will provide enough opening for your vehicles. If your recreational vehicle, for example, is bigger than the standard RV garage door sizes, you need to order a larger door. When you order a larger garage door in Houston, Texas, you will most likely want it reinforced. The larger the door the easier it will blow out in the event of high winds and hurricanes. The good news is that you can make all sorts of combinations in terms of materials, window styles, insulation options, sizes and styles and thus get a durable and beautiful door that will still be big enough for your cars. Whatever you choose, custom size garage doors installation will be completed with the utmost care by experienced pros. We send out pros that have the skills to install any type of door you choose regardless of its size and material. Let us assure you that our company will continue to serve your repair needs in the future should you ever need to fix a problem or schedule maintenance. Get the best Houston custom size garage doors & services by turning to us. Call us today to learn more.